Choose between different sizes of Java servers with a predefined CPU and memory to meet your application’s needs. Develop and run Java Web applications based on standard JSR APIs, and third-party Java libraries and frameworks that support these standards. Start, stop, scale, and configure Java applications using standard tools, our cockpit and DevOps capabilities. Leverage SAP Cloud Platform services and Java APIs. Benefit from the Apache Tomcat runtimes. 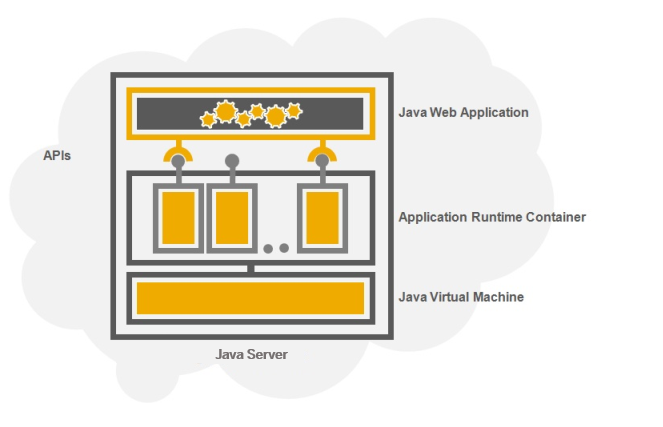 Java servers are virtualized hardware resources used by an SAP Cloud Platform Java application. Java: Getting Started - Set up your Java development environment and deploy your first application in the cloud.